Football Fare – Something for Everyone! We have to start this column out with a bit of a true confession….it has been a “while” since either one of us has been in Ramparts to drink or dine. In fact it has been well over a year – I believe they still allowed smoking! One of us is there every month dropping off the current issue but are always double parked and in a hurry so no time to patronize the place. We are also creatures of habit and tend to stay closer to the heart of Old Town so heading to Fairlington isn’t in our wheelhouse. Well….that is going to change. 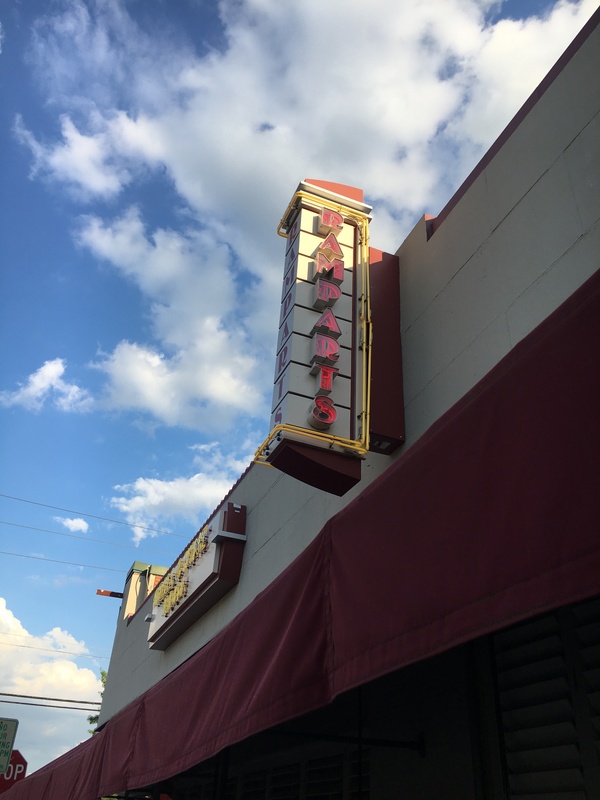 Ramparts was originally called The Cole Bin and has been around for almost 40 years. In 1978 it was renamed and quickly became a real neighborhood “watering hole”. During the 80’s it grew into more of a pub and a grill serving good bar food to the residents of the popular Fairlington area of Alexandria. A little over a year ago, proprietor Stephen Mann and his partners decided that it needed a face lift and boy did they ever do a good job! Gone are the dingy dark brick and smoke soaked furnishings on the Tavern side and the non-descript feel in the Grill area. The place now sports dark hardwood floors, white washed brick walls and soft leather seating on both sides. The new fixtures and wall art are a nice touch as well. There are 4 rooms including the bar and dining room on the Grill side, the pub on the Tavern side and the Fairlington Room which is a private dining space for up to 30. Let’s talk about the food and beverage. We aren’t going to regurgitate the menu for you since most everyone is tuned into an app on their communication device or have the technology to surf the internet to scout out the entire menu. That being said, Ramparts has a very extension beer and wine list. They have over 200 beers and ciders and a wine list for every palate and wallet. The menu is diverse and has something for everyone without being overwhelming. Our mission on this trip was to get some scoop on what they have going on during football season but we were really impressed with the brunch menu (served Saturday and Sunday until 3 pm) offerings. I guess since they serve it until 3 pm, if you aren’t up for wings, sliders, a Bud Light and all of the other “football” fare, you can have eggs benedict and a Bloody Mary during the 1:00 games! I guess we should actually consider what we were doing is checking out “Sporting Event” fare since they run specials during the baseball season as well as football. Through the rest of the baseball season you can always find Budweiser cans for $3.25 to celebrate the Nats and $3 Natty Boh’s if you follow the “O’s”! These specials continue throughout the NFL season with no particular loyalty to a team. There is a separate Pub Fare menu as well as the regular menu available during events. We sampled two of the starters and were very impressed. On a traditional vent, we picked The Jack Daniels Minis – Angus beef mini burgers with melted smoked provolone, sautéed onions, and a pickle chip on a potato bread slider bun with a side of Jack Daniels glaze – and they are fantastic. If you are a medium to medium rare beef eater, order these on the medium rare side. The hint to order mine on the medium rare side – from our server Sean – was a good one. Since they are smaller, they tend to keep cooking as they sit. On the wild side, we ordered the Shrimp Kickers – half pound of peeled shrimp sautéed in a spicy Gator sauce with white wine and garlic served over bacon, onion, cheddar cheese grits – and they were killer good. Another good hint Sean gave us was to order the Gator sauce on the side – it is really flavorful but it packs some heat. It isn’t for the faint of heart or tongue! The menu features the ever popular wings, Loaded Tater Tots, Chili Nachos, a Chicken Quesadilla and something a little different with Hot Peas, and a Grilled Brie starter. And….of course….a killer burger cooked to order with some of the best fries around. Gotta be something that interests you! The Tavern is the place for everything sports. 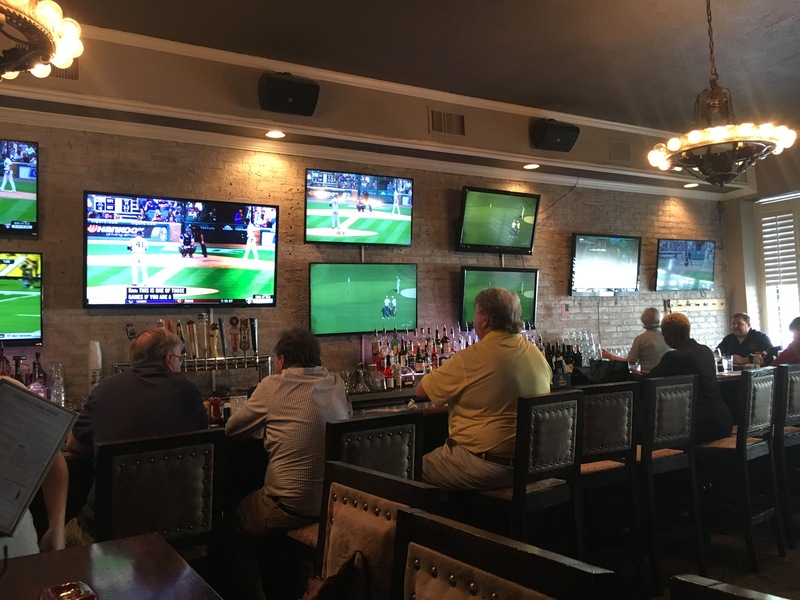 There are 30 HD televisions, surround sound for major games and local team specials – mentioned above. I am definitely going to find a seat for a couple of my Denver Broncos games this season! If you haven’t been to Ramparts in a while, do yourself a favor and stop in. You won’t be disappointed! 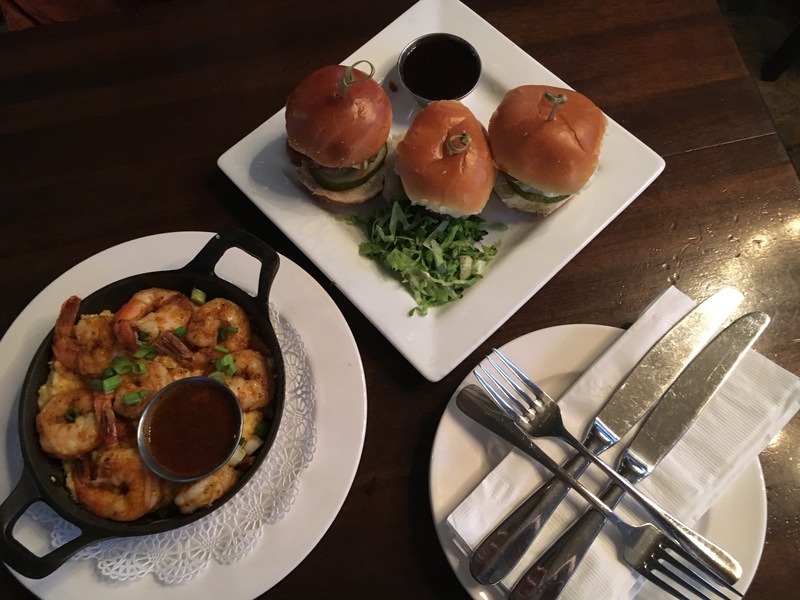 They also have a very popular Happy Hour at both the Tavern and Grill bars week days from 4 – 7 and weekly and monthly dinner specials. Be sure to check out their ad in this section for the September fare. « Baltimore Museum of Industry- Join the Industrial Evolution!